Books and the Dissemination of Knowledge in Medieval Europe at Khan Academy. It's full of great details and images. 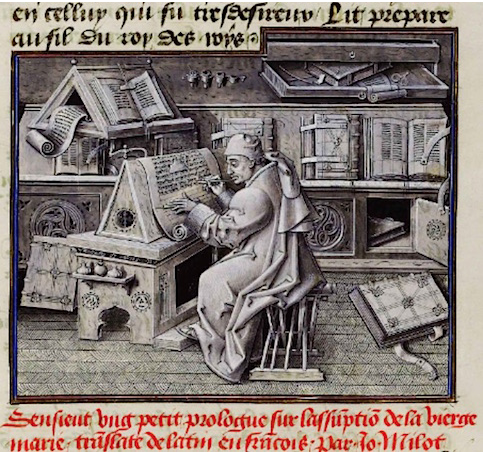 There are two sections: Making the Medieval Book and Using the Medieval Book. I especially like the first chapter: Listening to the Medieval book where Dr. Erik Kwakkel and Dr. Beth Harris look at two books and listen to the different sounds of the turning parchment pages. Parchment makers prepared skins, scribes cut their pens and filled their ink pots, and binders packed their workshops with leather and wood. All these activities would be in vain were it not for the single event that sparked them: copying words. Writing a medieval text with a quill is hard work. The pen could only make a more or less downward movement because of how the nib was cut. It meant that letters had to be broken up into multiple pen strokes. This made writing a very slow process: a Bible could easily take a year to complete. A scribe's handwriting—script—can tell us where and when he was trained to write. Script tells us these things because the shape of letters was constantly changing—script is thus an important historical tool that helps to place stories and information into their proper cultural-historical setting.